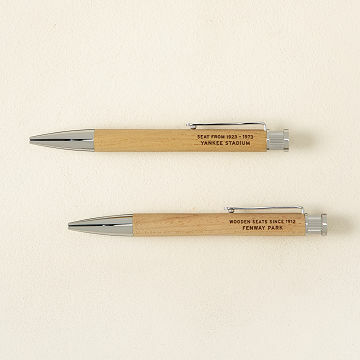 These wooden pens are made from salvaged seats of historic baseball stadiums. Give fans of America's favorite pastime a gift that really steps up to the plate! With these collector's rollerball pens baseball fans can hold onto their seats year-round. After being removed from iconic stadiums due to remodeling or demolition, salvaged seats are hand-turned into one-of-a-kind writing tools. Attractive and functional, the pen's smooth barrel has a slim profile, making it easy to handle when it's time to hit those epiphanies out of the park. A special way to honor the role these stadiums play in the history of the game, each retractable pen is laser engraved with its stadium's name and the years the seat was in use. Each keepsake pen is topped with a computer cut slender disc featuring the seat's original paint along with rhodium plated accents. Each pen is individually boxed with a Tokens & Icons certificate of authenticity. Officially licensed by MLB. Preparation of pen blanks and color disc at top done in the USA. Hand-turned and assembled in Taiwan. Click on the stadium of your choice to view the pen: Busch, Comiskey, Crosley, Dodger, Ebbets, Fenway, Forbes, Polo, RFK, Seals, Shibe, Tiger, Wrigley, Yankee. And for more stadium accessories, check out our Baseball Bat Bottle Openers or Ballpark Cufflinks. 5" L. Approx. .25" Dia. Uses an internationally available rollerball pen refill: Schmidt Capless Roller Ball - Short(also compatible with Parker Style Ball Point). Black ink. This was a gift that was warmly received. The pen was a surprise gift, and went over quite well. Having just a small piece of Yankee Stadium on her desk brings out some fantastic stories of my wife's visits there as a child. This is a beautifully packaged and designed pen for the baseball fan. My father in law, who owns his own business, loved it! Anytime he writes anything down he is reminded of his love of baseball and our love for him. I gave this as a gift to my father for his retirement. He almost never gets excited over any gift we give him, but he loves pens and he loves the Yankees, so this was perfect. I would buy this product again this time for myself. The pen was a great birthday for my father who loves sports as much as I do. We've been to Fenway a couple of times but for him to have something he can carry around from Fenway was really special to him. This was a perfect gift for the guy who has everything/sports nut. You could definitely say it was a "home run!" It got shipped quickly and my dad absolutely love it! Works great. Husband even has it on display and shows all his friends! I was looking for a unique gift for my cousin who has everything and is difficult to shop for. He is a big Yankees fan and loved this! My Dad loved it! He is difficult to buy for but this solved that problem! So glad I found this pen for his 89th Birthday!